Saxophone, clarinet, flute and Jazz piano lessons at our Phoenix Music Lessons studio. 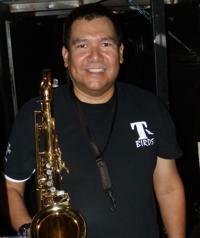 Kevin has taught flute, clarinet, saxophone and jazz piano lessons in Phoenix for over 25 years. He has had numerous students take first place as AZ All-State champions and is Well-versed in many styles of music as he has degrees in both jazz and Orchestral performance. Kevin has performed music in over 50 theatre productions and has toured internationally. Kevin has taught Phoenix saxophone lessons and Phoenix clarinet lessons for over 10 years and also teaches jazz improvisation and jazz piano. He is currently a 6-year resident of the Arizona Broadway Theatre. Literally thousands of private one on one music lessons! Woodwind and jazz piano lessons only. Why is Phoenix Music Lessons your best choice for saxophone lessons?